Jeff Immelt, chairman and CEO of GE, speaks during a discussion at the Newseum, August 4, 2014 in Washington, DC. 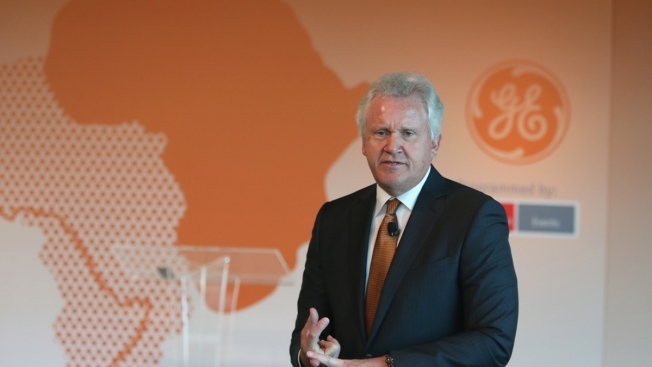 Immelt will be stepping down from the company's top post. General Electric says Jeff Immelt is stepping down as CEO and John Flannery, president and CEO of the conglomerate's health care unit, will take over the post in August. Immelt has been at the helm of the conglomerate for 16 years, overseeing a transformation that included selling many of the company's units. Over that time, General Electric sold its insurance, credit card, plastics and security divisions. It also invested more heavily in new technologies, including a recent $1.65 billion acquisition of LM Wind Power, a Denmark-based manufacturer of rotor blades for wind turbines. Flannery is a longtime General Electric executive, starting his career at GE Capital in 1987. He became president and CEO of the company's equity unit in 2002 and eventually joined the health care unit in 2014, focusing on advanced technologies. Shares of General Electric Co. climbed more than 3 percent in premarket trading. They are down about 7.6 percent over the last 12 months.